It may have many cores, but is it any good? Alcatel may not be the biggest name in mobile, but with the One Touch Idol X+ it may have one of the undercover hits of CES 2014. Building on the One Touch Idol X, which garnered a respectable 4-star rating in our in-depth review, the Idol X+ looks to kick things up a notch. Take a look at the Idol X+ spec sheet and it certainly appears to be an impressive offering on paper with a 5-inch full HD display - on par with the Galaxy S4 and Xperia Z1 - 2GHz octo-core (yes, eight cores) processor, 2GB of RAM, 16GB internal storage and 13.1MP camera wrapped up in a body which is thinner than the HTC One and Nokia Lumia 925 at 7.9mm. There isn't a microSD slot so you won't be able to build on the 16GB (or 32GB) of internal storage, 4G connectivity is sadly absent and the One Touch Idol X+ comes running Android 4.2 which isn't the latest version of Jelly Bean (that's 4.3), let alone the latest version of Google's platform - Android 4.4 KitKat. Historically Alcatel's handsets have been a bit of a let down in the interface and performance areas, with sluggish navigation and childish icons detracting from the overall experience. We hope the One Touch Idol X+ is able to overcome these software flaws and provide a truly fluid experience which makes the most of the powerful innards. 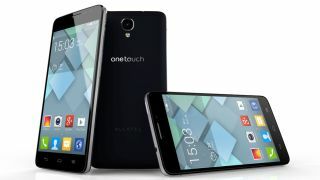 Update: We've now been given a price for the One Touch Idol X+, with Alcatel confirming a RRP of $250 for the handset - that's around £150, which would make it a bit of a steal. In terms of an Alcatel One Touch Idol X+ release date the phone will start shipping in February, with Russia its first port of call.